U.S. President Donald J. Trump speaks at Camp David after holding meetings with staff, members of his Cabinet and Republican members of Congress to discuss the Republican legislative agenda for 2018 in Thurmont, MD on January 6, 2018. 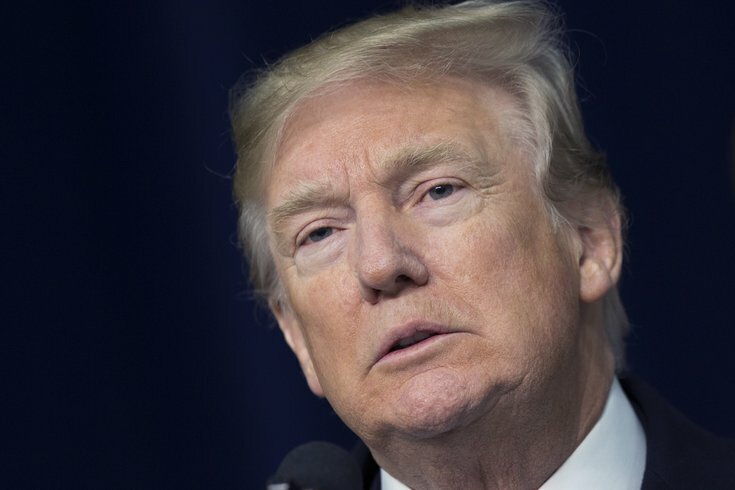 President Donald Trump took Sen. Pat Toomey to task on Wednesday over a bill he co-authored with Sen. Joe Manchin of West Virginia to strengthen background checks for gun purchases, proclaiming that the senators are afraid of the National Rifle Association. During a televised meeting on gun control between Trump and a bipartisan group of senators at the White House, Trump asked Toomey if the bill he worked on with Manchin after the mass shooting at Sandy Hook Elementary School in 2012 proposed raising the age requirement for rifles from 18 to 21. Toomey, a Republican from Pennsylvania, told the president it did not. "You know why? Because you're afraid of the NRA," Trump responded before pointing and laughing. The NRA opposed the 2013 bill, which aimed to improve reporting to the national database used for background checks and proposed expanding background checks for firearm sales at gun shows and over the internet. "Despite the aggressive opposition of the NRA, Senator Toomey never wavered in his commitment to this legislation," Toomey press secretary Steve Kelly said in a statement. "The NRA downgraded Senator Toomey’s rating and refused to back him for re-election. Senator Toomey has not received a dime from the NRA since joining the Senate. Senator Toomey has demonstrated that he is not afraid of the NRA or any other special interest group." Toomey told CNN after the meeting that he didn't think Trump's comment was aimed at him personally, but rather that the president was referring more generally to members of Congress. "If there's a Republican who has demonstrated he's not afraid of the NRA, that would be me," he said in the CNN report, also noting that the NRA hasn't donated to his campaign since 2010. Speaking to lawmakers before directing the remark at Toomey, Trump recommended giving "serious thought" to raising the age requirement for rifle purchases, despite the NRA's opposition to the proposal. Trump challenged Republicans at times throughout the listening session. Trump has pushed new firearms restrictions in the aftermath of the school shooting in Parkland, Florida on Valentine's Day, in which 19-year-old Nikolas Cruz allegedly gunned down 14 students and three staff members with an AR-15 semiautomatic rifle.